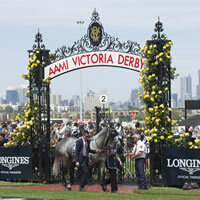 The smell of spring is well and truly in the air when Derby Day comes around and the Victoria Racing Club (VRC) will commence the fabulous four-day Melbourne Cup Carnival tomorrow with more than 90,000 racing enthusiasts expected to descend on Flemington for AAMI Victoria Derby Day. Racing purists are in for a treat with four exciting Group 1 races on a ten-event card including the AAMI Victoria Derby, a classic staying test for three-year-olds. All nine races at Flemington are group races and the Group 1 Longines Mackinnon Stakes and Group 3 Lexus Stakes offer the final opportunity to gain a start in the 2014 Emirates Melbourne Cup, while the Group 1 Coolmore Stud Stakes and Group 1 Myer Classic offer plenty of intrigue for three-year-old sprinters and older mares respectively. The fashion stakes are equally high with the commencement of Myer Fashions on the Field hosted by Myer menswear designer Jeff Banks and model Nikki Phillips, with guest judges including Myer designers Alex Perry, Arthur Galan and Dom Bagnato, Myer Ambassadors Kris Smith, Lauren Phillips and Jodi Anasta, Nova’s Lauren Brain, UK fashion illustrator Erin Petson and Myer Fashions on the Field Ambassador Rebeccah Panozza. This year’s competition again boasts a prize pool valued at more than $400,000, including a brand new Lexus IS 300h F Sport valued at up to $77,465. The exclusive Birdcage Enclosure will play host to local and international celebrities including Margherita Maccapani Missoni and Solange Knowles at Lavazza, Rich Sommer at Schweppes, and Joel and Benji Madden at Swisse. General admission patrons can enjoy winning post views at the new million-dollar permanent James Boag’s Premium Celebration Deck, a VIP marquee experience at Yellowglen Terrace, decadent cocktails at the Schweppes Flemington Fling Bar and the Diageo Cocktail Garden, complimentary shoe shines courtesy of Julius Marlow and the chance to grab up to $5,000 worth of TAB vouchers in the TAB Grab Booth. Back from international success in Las Vegas, Australian pop group Human Nature will perform the hit song ‘Stand by Me’ at 3.40pm before the feature Group 1 AAMI Victoria Derby. Pin & Win volunteers will be out in force selling Emirates Melbourne Cup pins in support of Melbourne Cup Carnival charity partner SecondBite. The official barrier draw for the $6.2 million 2014 Emirates Melbourne Cup will be held following the conclusion of the Derby Day meeting. Melbourne Cup Carnival tickets are still available for purchase from Flinders Street, Southern Cross and North Melbourne train stations or racegoers can jump the queues and buy online from Ticketek on their mobiles, even on raceday. Admission is free for children under 16 accompanied by an adult. Visit the VRC’s Melbourne Cup Canrival website for more information.